Street foods has become an important part of our lives in Lagos. They are readily available when the hunger pangs starts biting and you probably don’t want to go a restaurant. There are countless street foods you can find around. Irrespective, if you want to really enjoy street foods, there are some food combinations that taste better together. Jumia Travel identify some of these foods. This is because if you eat them alone, you can’t get the best out of it. However, ensure that where you buying it is hygienic. You can never compare eating fried yam alone and when you combine it with hot Akara balls. Wow! You will not get enough of it. And don’t forgot to ask the seller to add pepper! 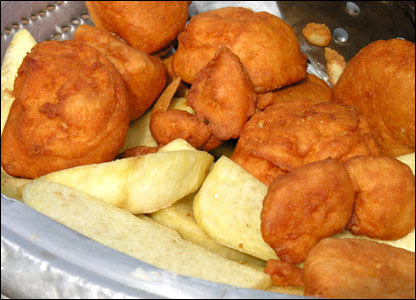 Other Akara combos include akara + bread and akara + pap. Whoever thought of roasted plantain and groundnut is a genius! In fact, you will always find groundnuts were roasted plantains are sold. So, when you buy roasted plantain, don’t forget to buy groundnut at the same time. This is arguably the king of street food combo in Lagos. You can hardly find anyone who takes Lacasera or any other beverages without a sausage roll in hand. This will temporarily tackle your hunger pangs. You can enjoy roasted or cooked corn on its own without coconut. But corn and coconut are fantastic when consumed together. If you are yet to taste this street food together, you should probably try it because the taste is out of this world. Eko and moin moin is another exciting combo. There is no way you can take eko alone. It must be eaten with moin moin if you are serious about enjoying your eko.